Android smartphone applications are rapidly emerging as powerful and widely adopted business tools, while Windows PCs comprise the vast majority of small office networks. But so far, the two environments have remained largely separate, which also adds to the workload of those who have to manage small business networks. However, BlueStacks may help make life easier for users and small office network managers. In a nutshell, it brings the mobile Android world to the PC, and vice versa, using virtualization. "Anybody with a PC now has access to mobile Android apps and anybody with an Android phone can now run their apps on a big PC screen," Rosen Sharma, CEO at BlueStacks told me Friday during a conference call. The BlueStacks icon shows up on a Windows desktop like any other Windows applications does. The company last week also announced it has formed a partnership with Citrix, which will offer Citrix Receiver enabling users to access the AppStore from their PCs. Citrix Receiver will also serve as the software client that will enable BlueStacks to run on laptops, desktops, tablets, and smartphones. Users will be able to see what Android apps look like when they run on larger PC screens. When an Android smartphone is connected to a PC, you can also use the mouse and keyboard to interact with the Android applications on your PC. 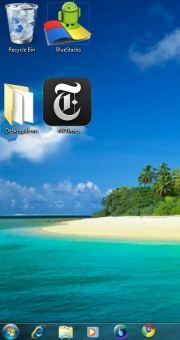 You'll also be able to download Android apps to a Windows PC or tablet and run them directly on those types of systems. Instead of serving as a dual operating system that boots up over Windows, BlueStacks runs like any other application on a Windows PC or tablet. You can also click out of any Android app you run with BlueStacks and access other Windows applications directly by just clicking out it. Potential Android users who are hesitant about buying an Android phone and investing in a subscription plan with a carrier can download and see how Android applications run on their PC first. With Citrix Receiver, network managers can set user privileges, schedule backup backups, and performance other administrator tasks for Android devices and applications that are connected to a Windows-based PC network. BlueStacks says it will announce a partnership with a yet-to-be named PC maker that will offer the application pre-installed with Windows. You will also be able to download a beta version of BlueStacks as early as the end of June. Access Android apps on a full-size PC screen with a mouse and keyboard. However, the company has yet to describe exactly how all of this will work. It will be interesting to see just how well Android applications are able to run on PCs with BlueStacks and how robust the administration tools will be. BlueStacks won't be the only way to access Android apps on other OSs and devices. Users of the RIM PlayBook will be able to access Android apps--although not immediately for all apps, because developers have to create special code to enable thm to port to the device. But if BlueStacks runs as advertised, the application could be a boon for small businesses that seek seamless integration between their users' Android devices and PC networks.